First Choice Emergency Room Desoto opened its new facility at 7am today. The new emergency room is located at 800 W. Belt Line Rd., DeSoto, TX and is open 24-7. “We are pleased to bring a facility to the DeSoto community and look forward to delivering the highest quality emergency medical care here,” said Dr. Anh Tat Nguyen, Facility Medical Director of First Choice Emergency Room DeSoto. To celebrate the opening, First Choice Emergency Room DeSoto made a donation to the DeSoto High School Eagle Band at the Emergency Room’s ribbon cutting with the DeSoto Chamber. Following the ribbon cutting, First Choice Emergency Room hosted a medical community open house. First Choice Emergency Room is the nation’s leading network of independent freestanding emergency rooms; it is both the largest and the oldest. First Choice Emergency Room is revolutionizing the delivery of emergency medical services for adult and pediatric emergencies by offering patients convenient, neighborhood access to emergency medical care. First Choice Emergency Room facilities are innovative, freestanding, and fully equipped emergency rooms with a complete radiology suite of diagnostic technology (CT scanner, Ultrasound, and Digital X-ray) and on-site laboratory. All First Choice Emergency Room locations are staffed with board-certified physicians and emergency trained registered nurses. 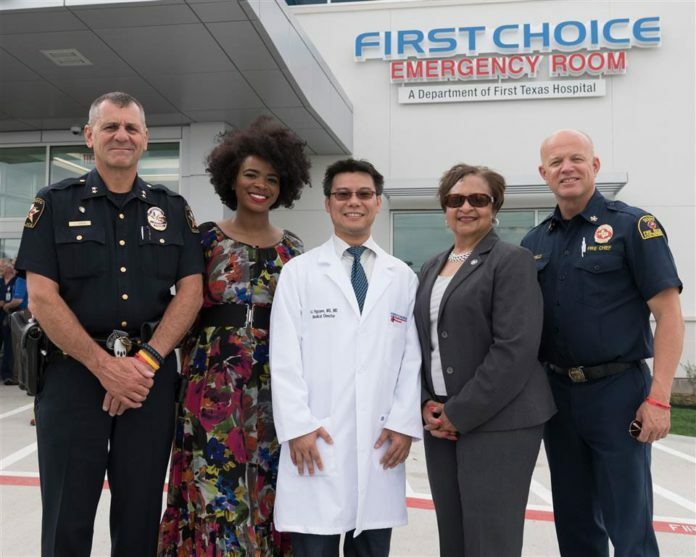 First Choice Emergency Room has facilities in Austin, Dallas/Fort Worth, Houston, and San Antonio. According to patient feedback collected by Press Ganey Associates Inc., First Choice Emergency Room provides the highest quality emergency medical care and received the 2013, 2014 and 2015 Press Ganey Guardian of Excellence Award for exceeding the 95th percentile in patient satisfaction nationwide. First Choice Emergency Room is an Adeptus Health company.